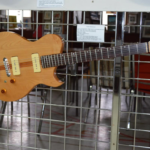 Larry Morden’s interest and love of guitar design and manufacture began in 1967. The first guitar he made used parts from a damaged acoustic. This experience spurred his interest in a love of “functional art”. The woods used for construction are carefully selected to represent the ornate character of the wood itself. Typically, finishes are applied to accentuate the natural beauty of the wood and to not disguise these incredible features. 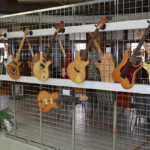 Larry’s history of custom design / build guitars began prior to 1977, but that is the year he felt he created his first professional/playable instrument as verified by comparative bench test in an engineering lab. This guitar is still being played today, 40 years and 100 guitars later. 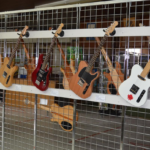 Larry taught guitar assembly in a local high school in Ottawa for a 10 year period before retiring. He also mentored local Luthiers before moving to Highgate in 2014. Larry started performing in bands in 1969 and continued through 2004. Larry’s artistry in wood is dedicated to his late wife. Larry’s life is focused around musical experiences including studio recording, engineering, production and live sound technician’s capacities.